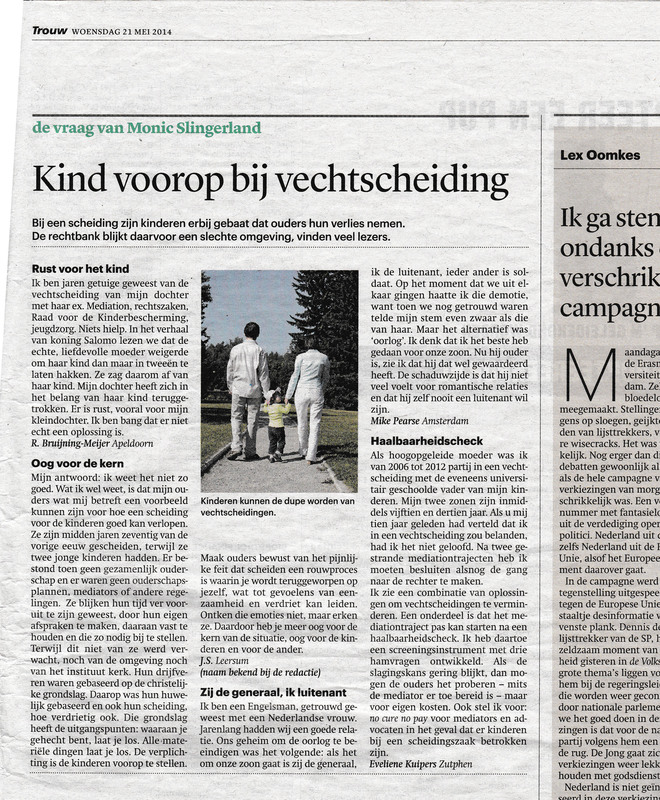 There was an article in the weekend ‘Trouw’ newspaper written by Monic Slingerland about divorced parents which invited readers to send in their responses. I sent in mine, in English, and it was translated and published. I’m an Englishman who was married to a Dutch woman. We’ve had a good relationship for years and our secret to ending the war was this: When it comes to our son, she’s the general, I’m a lieutenant and everyone else is a private. I hated taking a demotion—as a married father my voice carried equal weight to hers—but the alternative was War. I believe I did the right thing for our son. Now that he’s older, I think he appreciates this. The downside is that he has little respect for romantic relationships and he never, ever wants to be a lieutenant himself.